Is It Safe To Get Tattooed Over A Mole? People who get tattoos often think of their skin as a canvas. But what happens when your canvas has irregularities? Does it affect the way your tattoo will look? Moles, however, aren’t just blemishes, but feel and are shaped quite differently than the rest of your skin. This brings up another, often more pressing question: can you tattoo on them at all? In this article, we’ll go over what moles are and what having some means for your potential tattoos. Moles are growths on the skin caused by the skin cells clustering together. They’re usually brown in color and may have a few hairs growing out of them. Moles are usually nothing to worry about, and the huge majority of them will be non-cancerous (especially if you develop them before adulthood). Very few tattoo artists will agree to tattoo over a mole. And those that will tattoo a mole usually do it because they are either not properly informed (and perhaps not even licensed) or do not follow industry best practices. But why do most tattoo artists refuse to ink over a mole? Their reasons might have to do with the quality of the tattoo, the safety of the tattoo, or the jurisdiction they’re working in. One of the biggest aesthetic reasons for refusing to tattoo over a mole is that it’s difficult to get the color right. The mole isn’t like regular skin and it absorbs the ink differently, too. 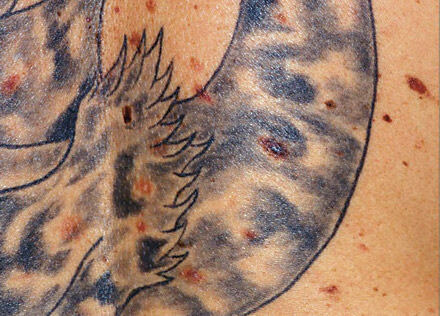 Tattoo artists who have tried to tattoo over a mole report that it absorbs too much of the ink too quickly, which can make it look overly pigmented. Every tattoo you get from a tattoo artist is that artist’s calling card, and if they’re not confident they can make your ink look right, they might refuse to do it altogether. There’s always some bleeding involved when getting tattooed. You are, after all, repeatedly applying a needle to your skin. But the tattoo gun typically only results in a modest and manageable amount of bleeding. That’s not the case with moles. Those who have tried to tattoo over them (as well as anyone who has accidentally cut one while shaving) will tell you that they have to deal with far more blood than usual. This excessive bleeding not only makes it more difficult to tattoo over the spot, but it could also lead to further complications. The most common reason tattoo artists give for not applying ink to a mole is that your mole’s natural color is important in monitoring your health. One of the biggest indicators that a mole has become cancerous is a change in its color. When you tattoo over a mole, the ink pigments mask that natural color and you may not be aware that your mole has changed colors. When dealing with cancer, it’s ideal to treat it as early as possible. Not knowing that your mole has changed color because you have a tattoo over it can delay you in getting the treatment you need. Different states within the U.S., as well as different countries, have their own regulations that govern tattoo parlors. In some jurisdictions, these regulations explicitly prohibit tattooing over moles and certain other kinds of skin conditions. What Can You Do if You Still Want a Tattoo? If you already had your heart set on getting a tattoo where you have one or more moles, there are two options that can allow you to do that without running any of the risks that come with tattooing over the moles themselves. By far the best solution is to find a way to incorporate the mole into your tattoo. It’s not always possible, but if you can choose a design that prominently features some brown or tan colors, you can simply incorporate your mole (and its natural pigmentation) into your tattoo by tattooing around it instead of over it. A more radical option is to have the mole surgically removed. This is a fairly simple procedure that dermatologists routinely perform on moles that show signs of being cancerous. Once you have healed from a surgical mole removal, however, you will most likely have a scar where the mole used to be. The good news is that you can safely tattoo over scar tissue and most tattoo artists won’t have a problem accommodating this. So, no, if you have a mole, you should not tattoo over it. And if you’re dealing with a tattoo artist who does not seem to be aware of the risks involved in tattooing over your moles, you owe it to yourself to find someone more knowledgeable to do your tattoo.